(Nanowerk News) The blood stem cells that live in bone marrow are at the top of a complex family tree. Such stem cells split and divide down various pathways that ultimately produce red cells, white cells and platelets. These “daughter” cells must be produced at a rate of about one million per second to constantly replenish the body’s blood supply. Researchers have long wondered what allows these stem cells to persist for decades, when their progeny last for days, weeks or months before they need to be replaced. Now, a study from the University of Pennsylvania has uncovered one of the mechanisms that allow these stem cells to keep dividing in perpetuity. The researchers found that a form of the motor protein that allows muscles to contract helps these cells divide asymmetrically, so that one part remains a stem cell while the other becomes a daughter cell. Their findings could provide new insight into blood cancers, such as leukemia, and eventually lead to ways of growing transfusable blood cells in a lab. The research was conducted by Dennis Discher, professor in the Department of Chemical and Biomolecular Engineering in the School of Engineering and Applied Science, and members of his lab: lead author Jae-Won Shin, Amnon Buxboim, Kyle R. Spinler, Joe Swift, Dave P. Dingal, Irena L. Ivanovska and Florian Rehfeldt. They collaborated with researchers at the Université de Strasbourg, Lawrence Berkeley National Laboratory and University of California, San Francisco. It was published in the journal Cell Stem Cell ("Contractile Forces Sustain and Polarize Hematopoiesis from Stem and Progenitor Cells"). The standing theory to explain these cells’ near immortality is asymmetric division, though the cellular mechanism that enables this kind of division was unknown. Looking to identify the forces responsible for this phenomenon, the researchers analyzed all of the genes expressed in the stem cells and their more rapidly dividing progeny. Proteins that only went to one side of the dividing cell, the researchers thought, might play a role in partitioning other key factors responsible for keeping one side a stem cell. They saw different expression patterns of the motor protein myosin II, which has two forms, A and B. Myosin II is the protein that enables the body’s muscles to contract, but in nonmuscle cells it is also used in cell division, where it helps cleave and close off the cell walls as the cell splits apart. With these myosins as their top candidate, the researchers labeled key proteins in dividing stem cells with different colors and put them under the microscope. The researchers then performed in vivo tests using mice that had human stem cells injected into their bone marrow. 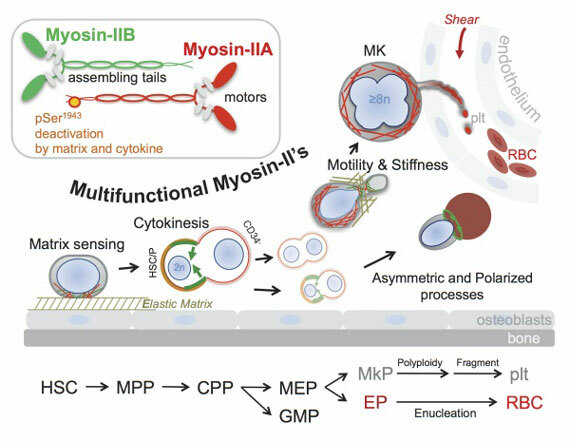 By genetically inhibiting myosin IIB production, the researchers saw the stem cells and their early progeny proliferating while the amount of downstream blood cells dropped. “Because the stem cells were not able to divide asymmetrically, they just kept making more of themselves in the marrow at the expense of the differentiated cells,” Discher said. The researchers also used a drug that temporarily blocked both A and B forms of myosin II, finding that it increased the prevalence of non-dividing stem cells, blocking the more rapid division of progeny. The researchers believe these findings could eventually lead to the ability to regrow blood stem cells after chemotherapy treatments for blood cancers or even for growing blood products in the lab. Finding a drug that can temporarily shut down only the B form of myosin, while leaving the A form alone, would allow the stem cells to divide symmetrically and make more of themselves without preventing their progeny from dividing themselves.